In response to the obsolescence of the Baldor-Reliance fractional horsepower (FHP) gearmotor line, we are excited to announce the addition of (80) new 90V and 180VDC gearmotors that are fully compatible with unfiltered SCR speed controls. The gearmotors feature SCR rated windings that run at 2500 RPM armature speed at 90V or 180VDC respectively. The new stock models can replace 90V or 180VDC gearmotors sold by Baldor, Bison Gear, Leeson, or Grainger. Tech Tip: What is an “SCR rated” PMDC gearmotor? We define it as a permanent magnet DC gearmotor that is designed to operate with an unfiltered SCR speed control while delivering similar speed and torque performance as a PMDC gearmotor that is designed to be operated from a filtered DC speed control or from a PWM speed control. 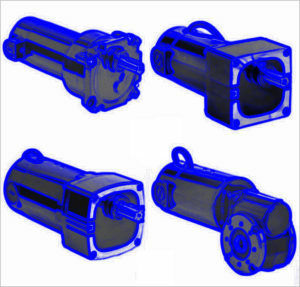 SCR rated PMDC gearmotors or motors are designed to remain within their safe operating temperature range while delivering full rated torque over the entire speed range (when operated with an unfiltered SCR speed control). This is in contrast to PWM-rated PMDC gearmotors or motors which would need to be operated at reduced torque if they were operated with an unfiltered SCR speed control.